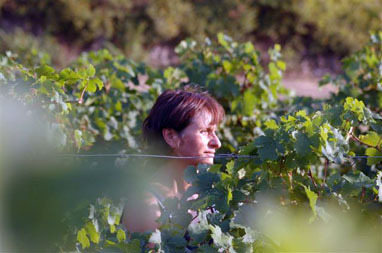 Isabelle and Mathieu Champart were relatively new to winegrowing when they first took over Domaine Bramefan (as her family’s farm is also known), in Saint-Chinian, in 1976. Isabelle was a Parisian with a degree in Geography, while Mathieu came from a family of farmers in Champagne. For nearly twelve years they sold their grapes to the local cooperative. Though they waited until 1988 to bottle under their own label, they won almost instant acclaim, and have become the standard against which other producers in the appellation have been measured ever since. Mathieu tends to the vines, and Isabelle makes the wines—that their home is surrounded by their vineyards makes their division of labor all the more poetic. The Champarts have made significant changes to their business over the years. While the domaine started from just a simple, humble, stone farmhouse, they later added a winery and have expanded the holdings from eight to twenty-five hectares (sixteen of which are consecrated to vineyards, the remaining nine to arable crops and orchards). The terroir here is a patchwork of soils: steep slopes of clay and limestone (Mourvèdre), brightly colored marl (Carignan & Syrah), limestone (Syrah & Grenache) and lower slopes of clay and sandstone (Cabernet Franc). They live among their old vines on a gentle slope and have slowly started integrating more organic practices into their farming. Though the wines are easy to appreciate now for their inky complexity, they age extremely well and shine after some decanting.